Many people argue that these strict voting laws are primarily being enacted to help suppress a group of people who typically vote Democrat from being able to vote. I bet the Republicans never thought these new laws would keep a former Speaker-of-the-House from getting his voter’s ID, too. Texas has some of the most restrictive laws put into place recently. 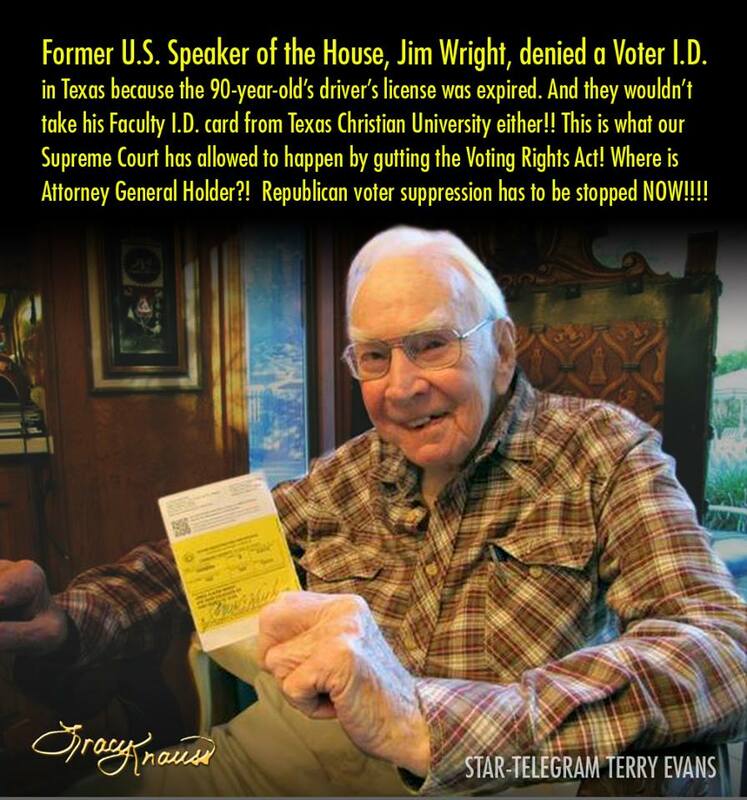 Jim Wright, 90, who served in Congress as a Democratic rep for Texas for 34 years, until resigning in 1989, told the newspaper he realized last week that he didn’t have a valid ID to vote in Tuesday’s elections. He said he was refused a voter ID card because his driver’s license expired in 2010 and his faculty ID from Texas Christian University in Fort Worth, where he teaches, doesn’t meet requirements under the state law enacted in 2011. Texas passed some of the most restrictive voter ID rules in the nation, which have been allowed by recent U.S. Supreme Court rulings invalidating part of the Voting Rights Act. A voter must have proof of citizenship — a passport or certified copy of a birth certificate — and two other pieces of identification such as a driver license expired less than two years, a voter registration card, school records, military records or a Social Security card, to receive an ID valid for voting. When I saw this tidbit come across Facebook a few hours ago, I did a Google search for more information. What’s interesting is that the sites which came up in the search are all the more liberal, progressive sites. 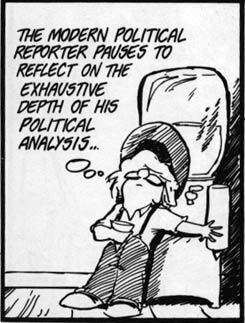 Nothing posted, as of yet, from any of the “main stream media” owned and ran by the Oligarchs. Sure, Google search “learns” what sites are favored, but the MSM sites take priority, such as CNN, Washington Post, NY Times, and so on. Nada from them. At his age, many people don’t have the required ID cause they no longer drive or travel outside the country, and may have never had a birth certificate. School and military records might be long gone. So I hope he has his voter ID or SS card. I know older folks tend to take voting seriously so I hope they’re aware of the new requirements. Thing is, he’s gone his whole life without a problem voting – especially since voting has always been so encouraged and supported. Now, someone who used to help run the country can’t vote due to some stupid new law that was never necessary in the hundreds of years prior. At that point I had to turn it off or chuck something at the TV. That’s pretty pathetic. But I’ll bet the powers that be in Texas aren’t particularly concerned about it since he’s a Democrat. Probably not. I thought about that, too. But hell hath no fury than a Republican scorned by his own party! Probably not but, I’m sure there are many older Republicans who’ll be shut out by these requirements too.